Have you ever wondered why you can’t crush the grapes you purchase at the grocery store and turn them into a tasty wine? If your answer is yes, then you’ve wondered what most people wonder but are too scared to ask: What is the difference between table grapes and wine grapes? Winemakers Adrian & Rebecca Santolin explain. We thought we’d share a pic, along with a little background info, on the differences between supermarket grapes and wine grapes. On the left-hand side in the photo above, are table grapes from the supermarket. On the right are our Chardonnay grapes. 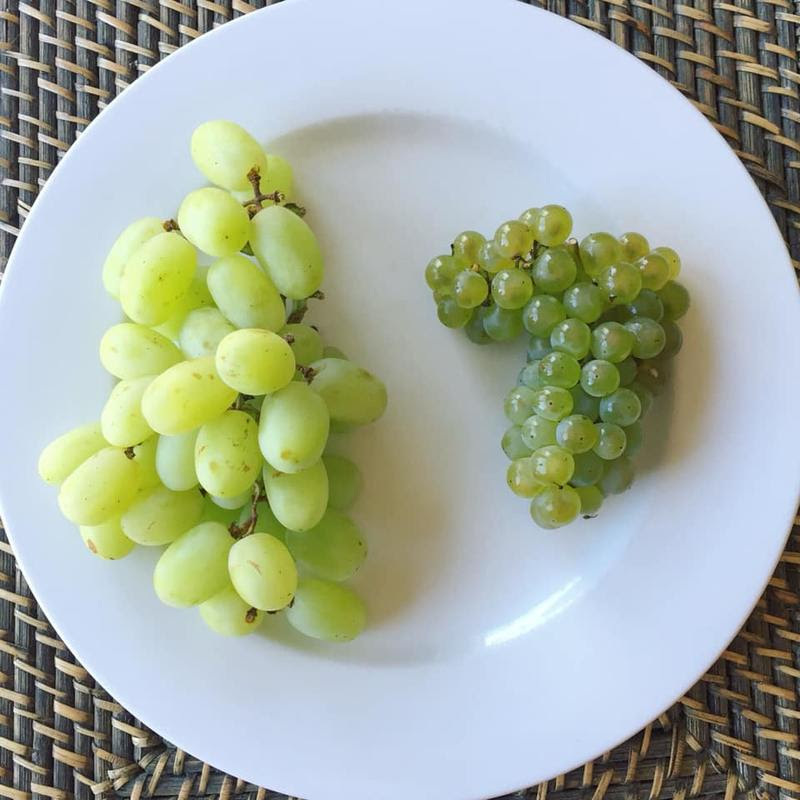 As you can see, table grapes are noticeably larger, they are seedless, have thinner skins and thicker pulp and a much lower acidity level. They are not suitable for making wine. In comparison, wine grapes (in this case our Chardonnay) are smaller, they have thicker skins, a higher juice content (vs pulp), many seeds (which are quite bitter if you bite into them), incredible flavour and a higher sugar content – which is what gets fermented and determines the alcohol content in the wine. High quality wine grapes are grown with the intention of maximising concentration, and balance of sugar, acid and flavour in the fruit. Vines are cropped lower, and therefore lower yields are produced in order to intensify these characters. Table grapes are actually different to wine grapes and are grown with higher yields and a focus on achieving crisp skins and juicy pulp. We hope you enjoyed this little afternoon grape lesson… now, go pour yourself a well-earned glass of vino, and have a great week! Follower Naked winemakers Adrian & Rebecca Santolin on their Naked winemaker page for more wine education and updates from their Yarra Valley winery. Angels, invite your wine-loving friends to join our amazing community! You’ll receive a credit in your Naked Wines piggy bank and they’ll receive $100 off their first case. Become an Angel (customer) and join the winemaking revolution. Angels, support independent, Aussie and New Zealand winemakers while receiving better wine for their money. For more information check out our website.